Its Spirit, Temperament, Intelligence, Size, and Coat Make It a Great All Around Pet. We have been involved with breeding, showing and training dogs for over 25 years. After successfully training and exhibiting Bouvier des Flandres, Rottweilers, Giant Schnauzers, and Doberman Pinschers in conformation and obedience, we have dedicated our passion and experience to breeding Kerry Blue Terriers. In our opinion, the KBT is an excellent companion, show, and performance (agility and obedience) dog. Its spirit, temperament, intelligence, size, coat, and conformation make it a great all around pet and competitive show dog. We have one to two litters a year and strive to produce Kerries with excellent temperament and conformation. All of our puppies experience a comprehensive rearing and socialization regimen. With careful attention to every aspect of breeding, raising, socializing, training, and placing our Kerries, we hope to contribute to this magnificent breed. CH Paxon's Blue Diamond ROM - "Hope"
We recognize the importance of personality, socialization, and training as important element of owning a KBT or any dog. We are one of the guardians of the breed and will protect and advance the interests of the breed. 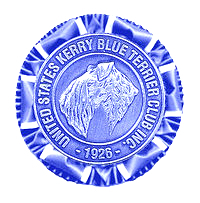 Diana Thompson of Diana's Kerries has been recognized and accepted into the American Kennel Club Breeder of Merit Program. This page last updated on 01-19-2013.